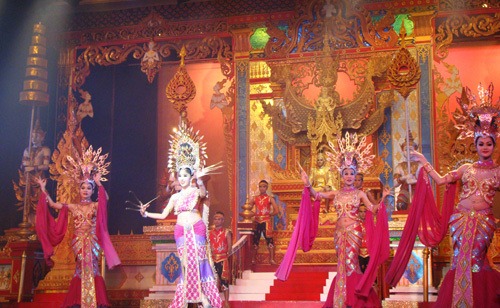 Alcazar Cabaret Shows in Pattaya Beach, Thailand. Book Online! The Alcazar show has been entertaining audiences from around the world for almost 20 years. A thrilling figure of over 1,000,000 audiences have seen this show ever since it has begun. You will experience the magic of Alcazar's state of the art computerized lighting system and be dazzled by the effects of its "Circle Surround Sound System" but that is just the beginning. Prepare to be entertained in grand style by our 400+ wonderfully talented artists and entertainers. The show is hosted everyday and timings are 6:30 pm, 8:00 pm, and 9:30 pm respectively with an additional show on Saturdays at 11:00 pm also. Normal seats cost 500 Baht per person and the V.I.P. seats cost 700 Baht per person. Both type of seatings include one welcome drink too.